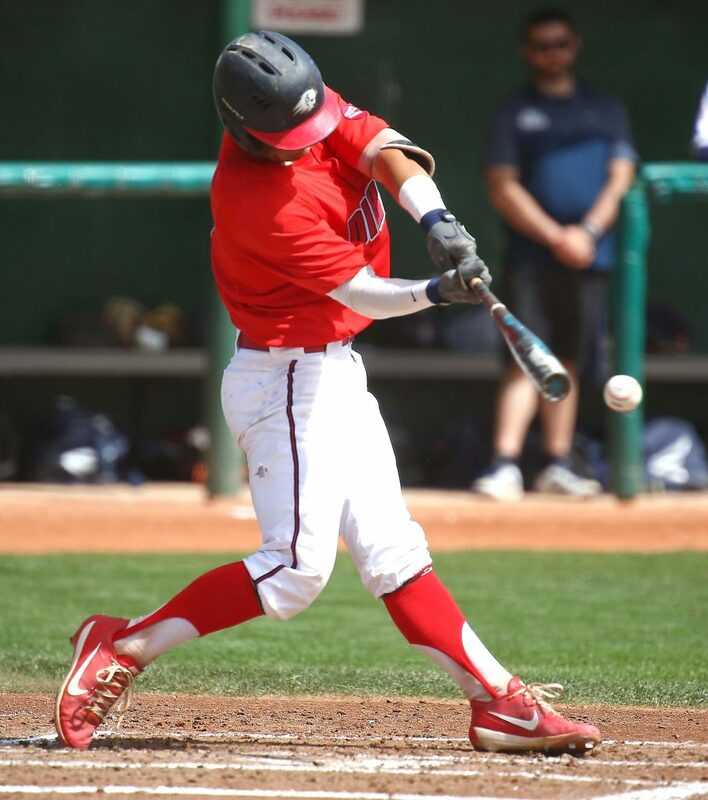 ST. GEORGE – Junior Gabe Taylor homered and pitched six solid innings to help lead Dixie State to a 7-5 series-clinching win over Fresno Pacific Saturday afternoon at Bruce Hurst Field. The Trailblazers went 9-3 on their 12-game home stand and have won 12 of their last 16 overall to move to 18-20 overall, 14-14 in Pacific West Conference play. FPU (15-15/12-12 PacWest) took an early 2-0 lead on Taylor and the Trailblazers with single runs in the second and third frames. 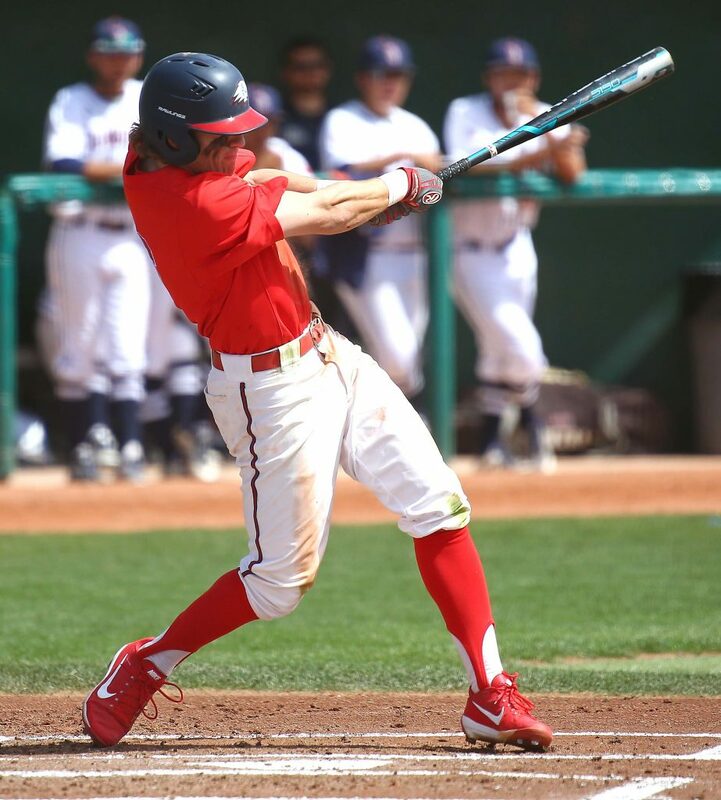 Dixie State got those runs back and more in the home third when Jagun Leavitt reached on a one-out single and Joe Raymond was hit by a pitch ahead of Taylor, who helped his own cause by connecting for his first collegiate home run, a three-run blast to left field to give DSU a 3-2 advantage. 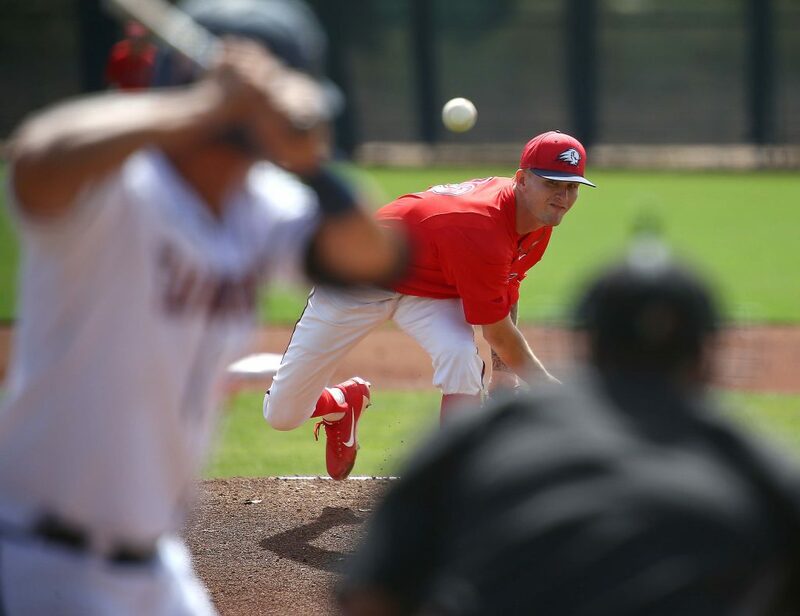 Taylor then settled in, retiring nine of the next 11 Sunbirds he faced, while the Trailblazers struck for three more runs over the next three innings to extend to a 6-2 lead after six complete. Tyler Hollow drove in a run with a single in the fifth, while DSU plated two more runs in the sixth on a Kyle Hoffman run-scoring hit and a Raymond sacrifice fly. Fresno Pacific did make it interesting late as the Sunbirds took advantage of a two-out DSU error in the seventh for one run, and managed to cut the deficit to 6-5 in the eighth with an Eddie Sievers two-run single. 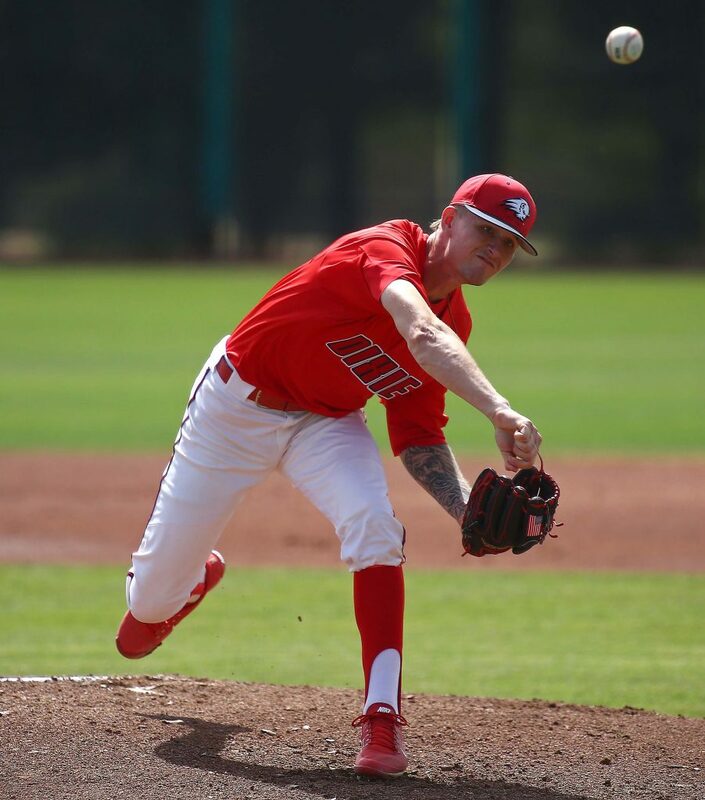 However, that would be as close as FPU would get as the Trailblazers picked up a big insurance run on a Leavitt two-out single in the bottom of the eighth, while senior closer Tanner Howell (S, 4) retired the Sunbirds in order in the ninth to end the game. Leavitt collected three hits out of the lead-off spot to pace the DSU offense, while Hollow and Hoffman finished with two hits apiece as the Trailblazers pounded out 10 hits in the game. Taylor (W, 3-4) fanned three and scattered six hits and two runs over his six innings of work to win for the third time in as many starts. 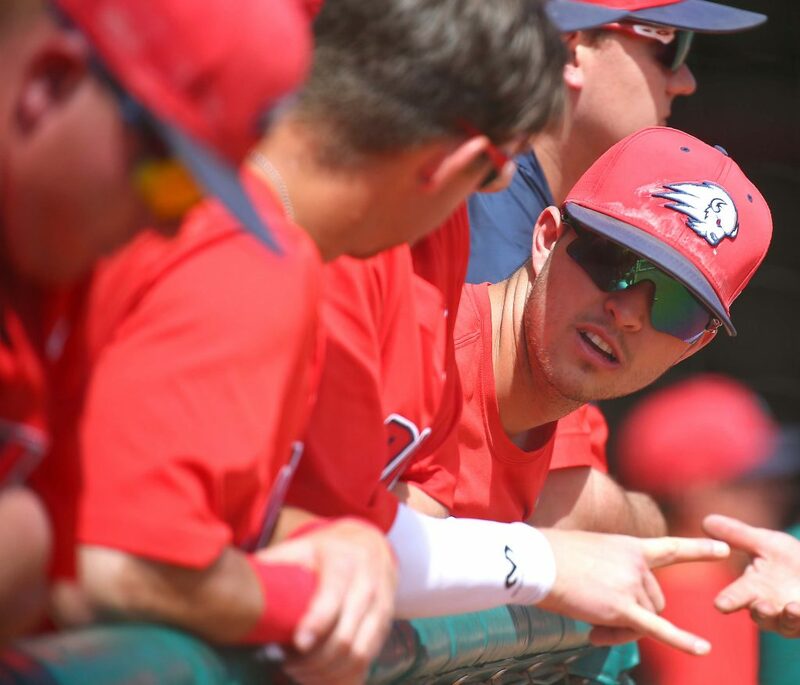 After a much-needed week off, Dixie State begins its final PacWest road swing with a four-game series at conference newcomer Biola on April 19-21. 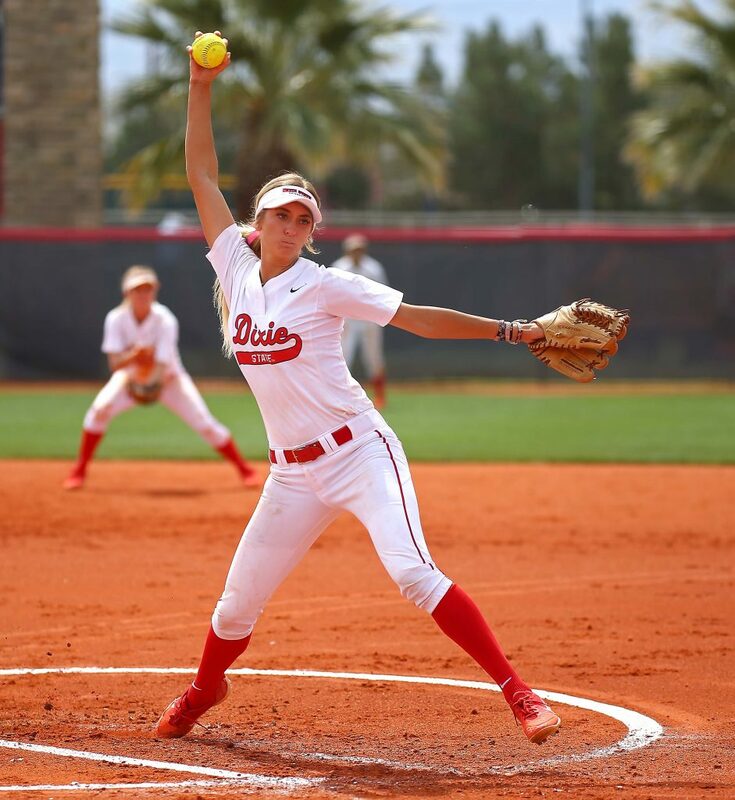 Freshman Cambrie Hazel pitched an eight-inning no hitter in game one and the Dixie State offense exploded for 11 runs in game two as the No. 7-ranked Trailblazers completed a perfect 6-0 road trip to California with a sweep of the Penguins. 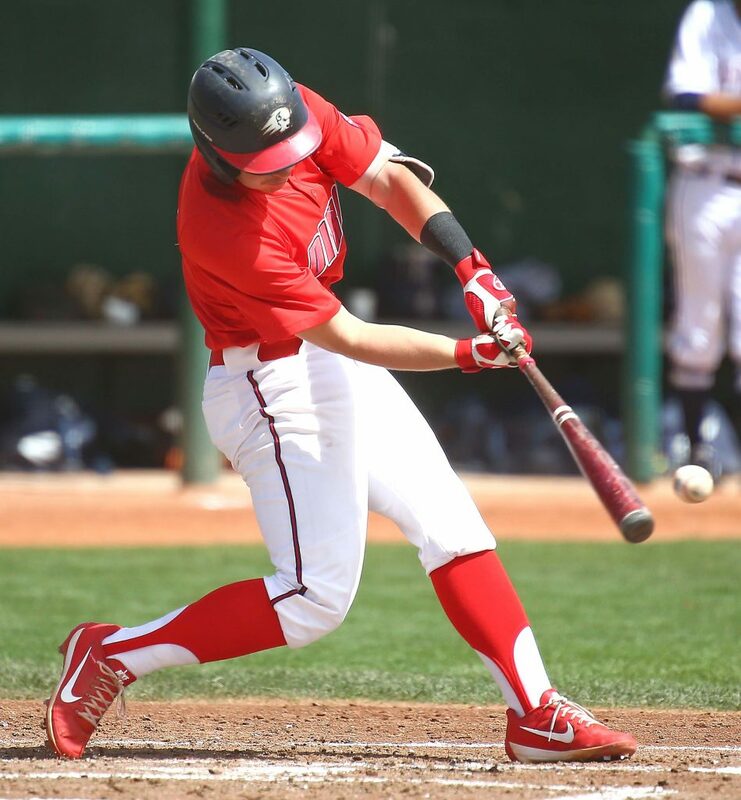 Hazel, the Spanish Fork native, has already had an amazing freshman year. She’d thrown three no hitters going into Saturday’s game at Dominican and has an earned run average of 0.92. But she might have topped it all Saturday, throwing all eight innings of the extra-inning affair, striking out 14 DU batters and allowing no hits and just two walks. After issuing a first-inning walk, Hazel retired 10 straight Penguins. A Blazer error and Hazel’s second walk gave Dominican runners at first and second with one out in the bottom of the fourth with the scoreboard still reading 0-0. But Hazel induced a groundout and a pop fly to wriggle out of the jam. She then retired the Penguins without incident the next four innings. She needed the effort as the DSU offense was held down by Dominican pitcher Gaby Katafias. The Trailblazers finally broke through in the extra frame. Janessa Basset led off the top of the eighth with a double and went to third on a DU error that also allowed Brenna Hinck to reach base. 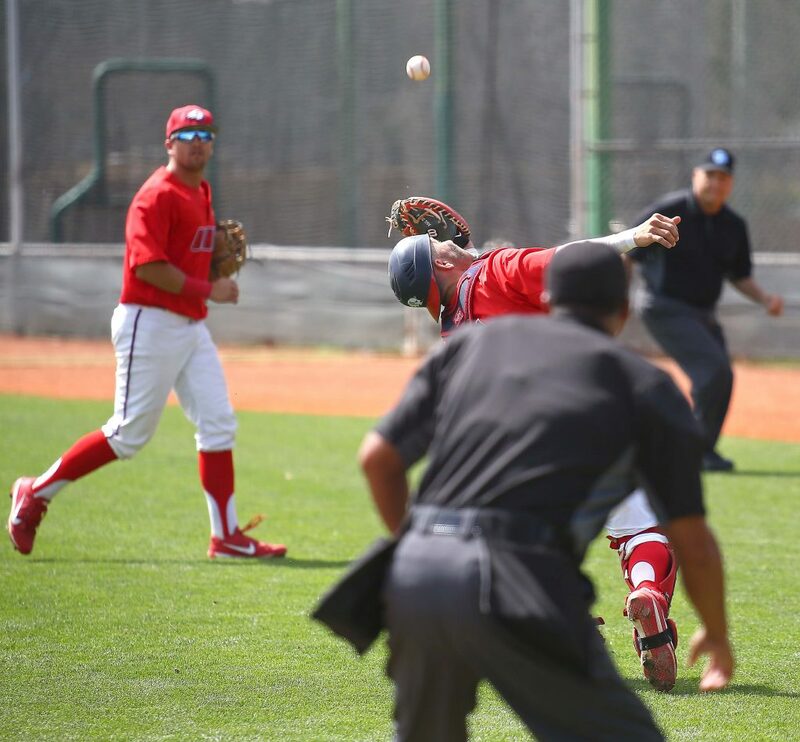 Bailey Gaffin then loaded the bases by reaching on a fielder’s choice. Kori Gahn broke the scoreless tie with a single that brought Bassett home. Jessica Gonzalez then made sure this would be a Dixie State win by socking a grand slam over the left field fence to make it 5-0. Hazel completed the no hitter by retiring the Penguins in order in the bottom of the eighth. 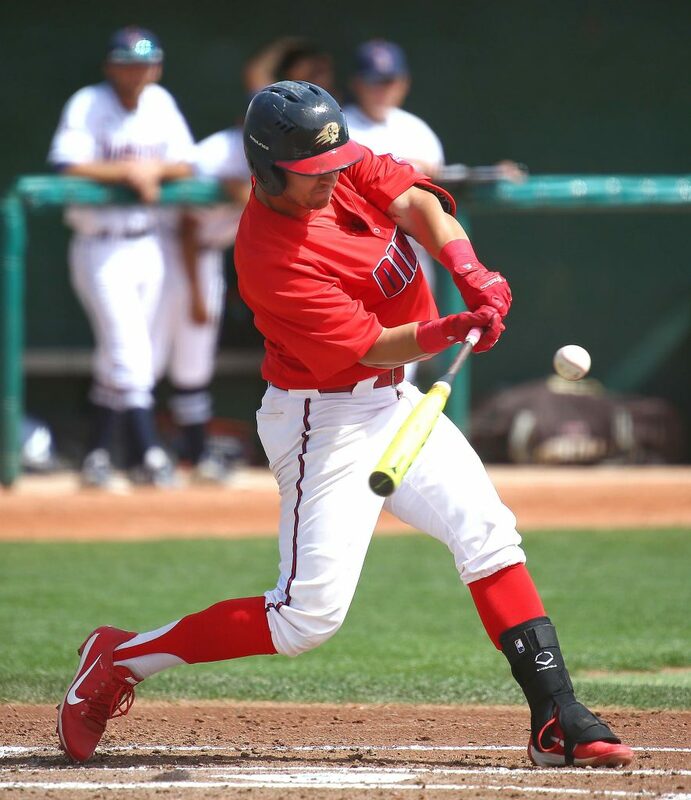 In the second game, DSU rolled out to an 8-0 lead and cruised home from there. Gaffin had RBIs in the first and third inning to make it 2-0, then Dani Bartholf homered in the fourth as part of a three-run rally that pushed the advantage to 5-0. In the fifth, Kenzie Sawyer socked a homer and the lead grew to 8-0. 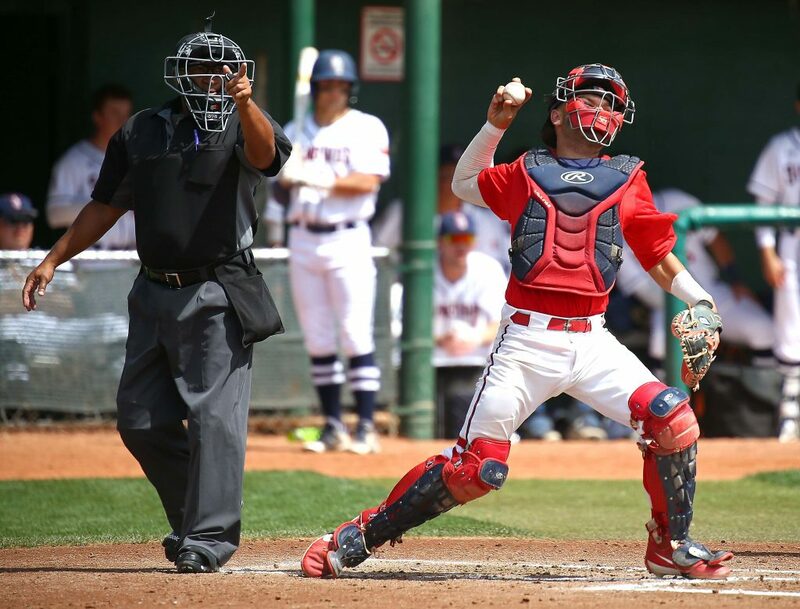 Dominican avoided the eight-run mercy rule with a run in the bottom of the fifth, but Dixie State got three runs in the top of the seventh in support of pitchers Alex Melendez and Alexis Barkwell. DSU had 10 hits in the victory, with Melendez picking up her ninth win in the circle by allowing just one hit through four innings of work. 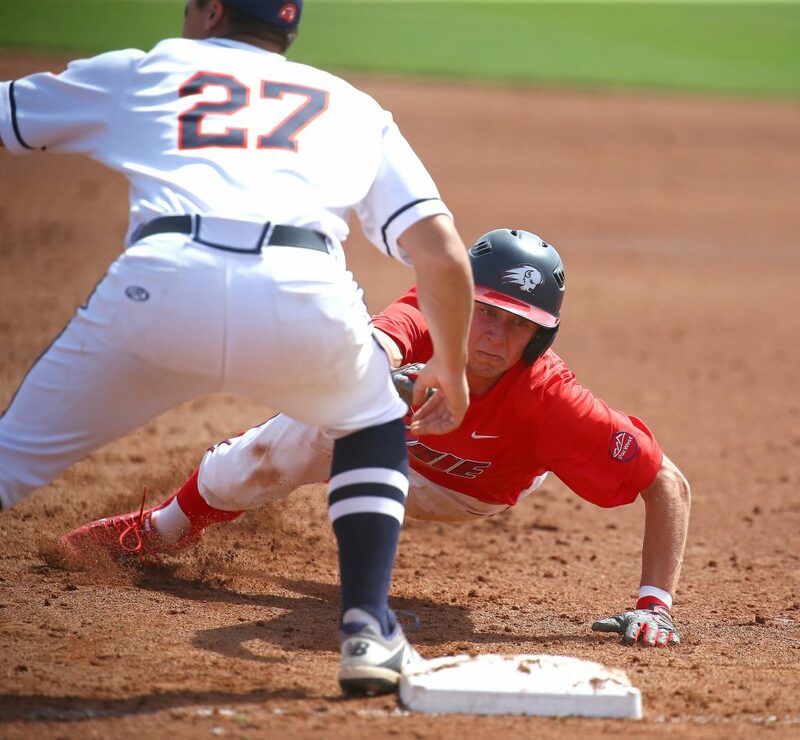 Bassett stole a base in each game and now has 29 steals in 30 attempts this season. 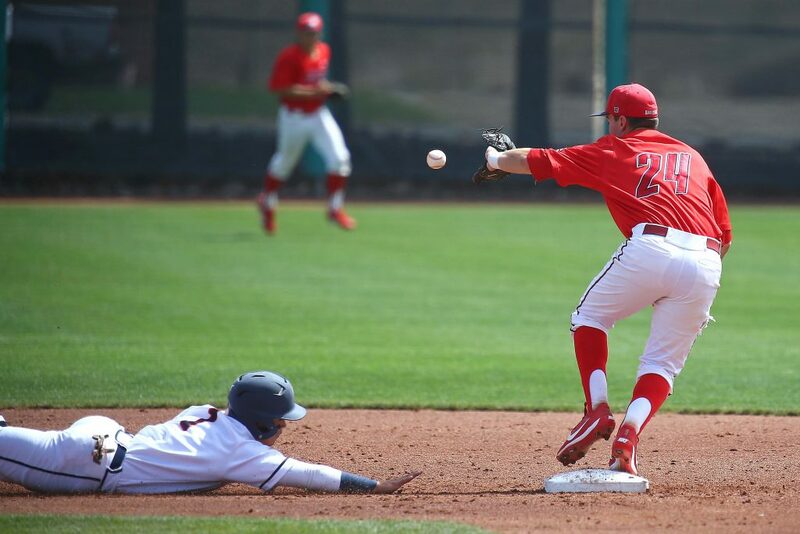 Dixie State, 32-4 overall and 16-4 in conference, returns home for doubleheaders on Friday and Saturday against first place Cal Baptist. 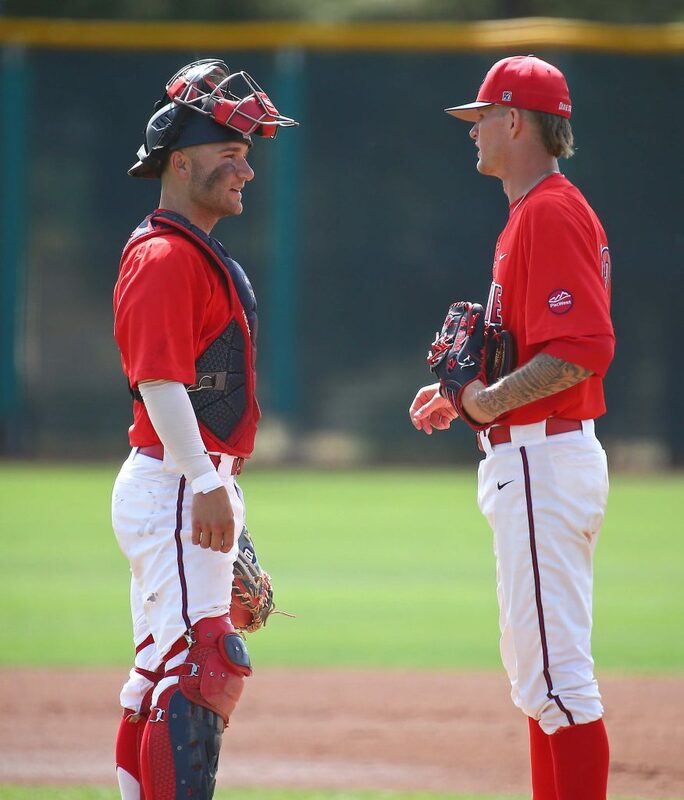 Friday’s DH starts at 3 p.m. Dominican is 14-28 and 5-17.